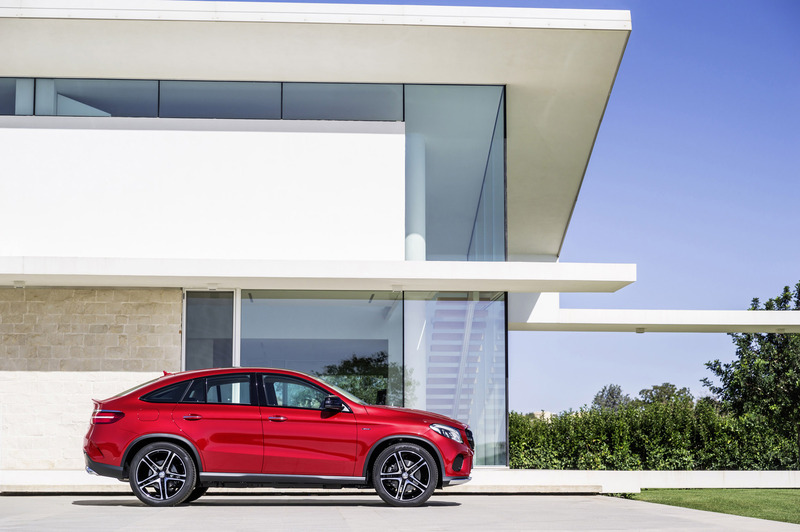 Mercedes-Benz is combining two classes of vehicle - each with its own distinct style - to make a new model, the Mercedes-Benz GLE Coupe. The sporty nature of a coupe dominates, imbued with the striking characteristics of a robust SUV. 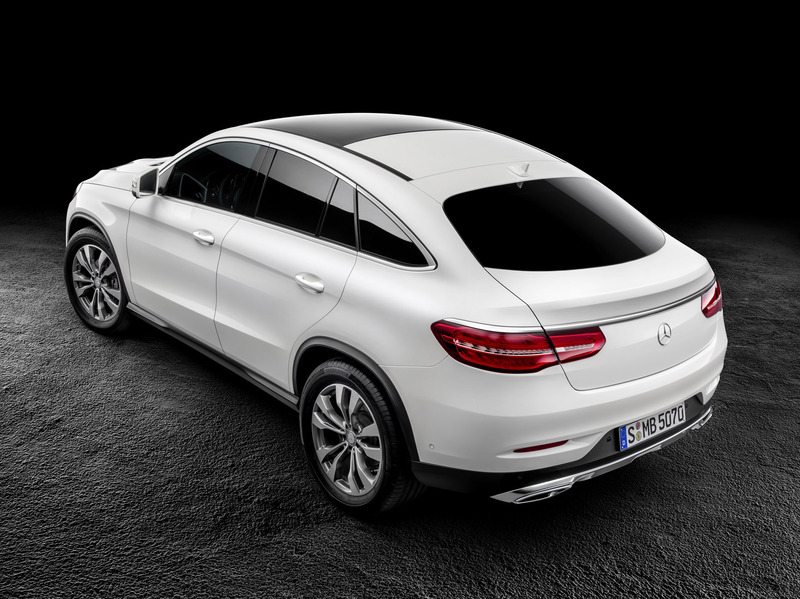 In addition to convincing on-road vehicle dynamics, the GLE Coupe looks impressive as well. 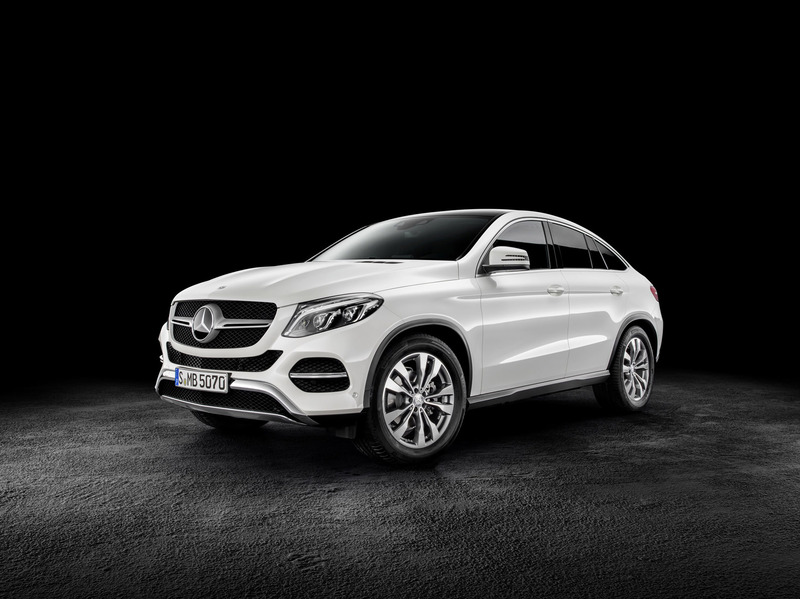 With its flowing side contour, elongated and low greenhouse, striking radiator grille with central chrome louvre and rear end design, the GLE Coupe cites styling features typical of particularly sporty Mercedes-Benz models. At the premiere the GLE Coupe will be available as a diesel or petrol model with an output range of between 190 kW (258 hp) and 270 kW (367 hp). 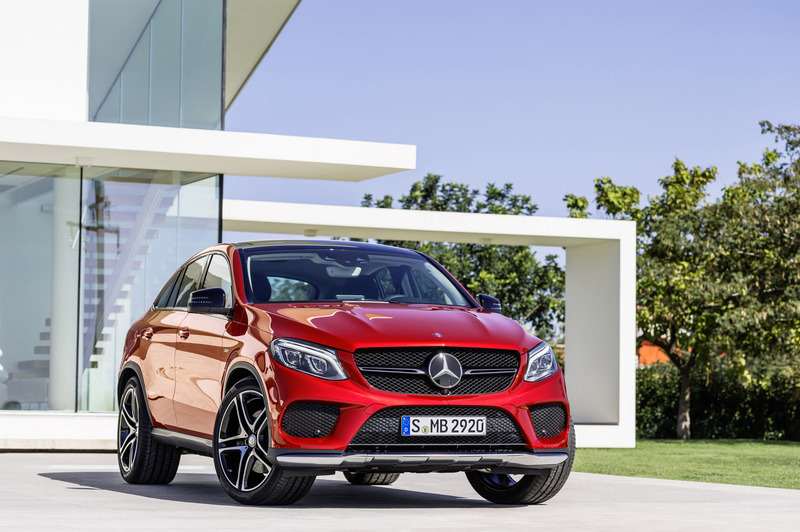 The top-of-the-range model GLE 450 AMG, the first representative of a new Mercedes-AMG product line - the AMG sports models - is particularly attractive. In addition to the generous amount of standard equipment, the DYNAMIC SELECT dynamic handling control system, the Sports Direct-Steer system and the driver assistance systems typical of the brand, the GLE 450 AMG always comes with the 9G-TRONIC nine-speed automatic transmission and 4MATIC permanent all-wheel drive. "Our GLE Coupe combines typical coupe attributes, such as sportiness, dynamism and agility, with the confident presence, versatility and robustness of an SUV", says Prof. Dr Thomas Weber, Board Member responsible for Group Research and Mercedes-Benz Cars Development, in characterising the latest member of the Mercedes-Benz model family. 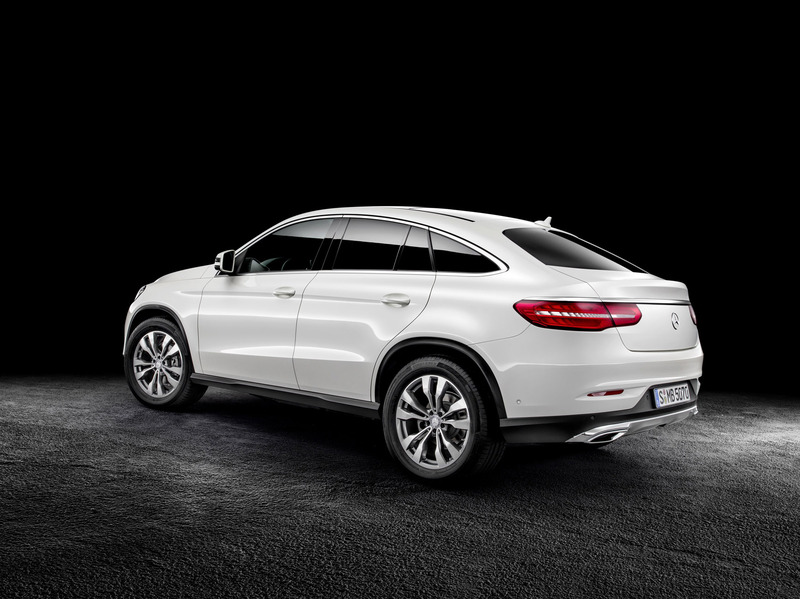 The GLE Coupe is the new addition to the successful portfolio of Mercedes-Benz coupes. Alongside the classic, two-door C, E and S-Class models and the four-door CLS and CLA-Class coupes, the new coupe displays a highly individual interpretation of the physiognomy and light-footed approach typical of this family of vehicles. 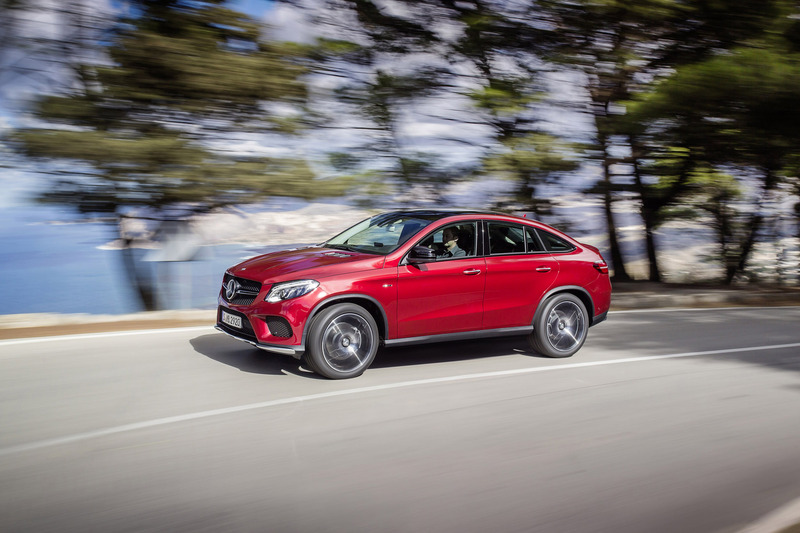 "For Mercedes-Benz, the GLE Coupe is the trailblazer for a versatile vehicle class. It will enable us to win new customers for our brand", says Ola Källenius, Member of the Divisional Board of Mercedes-Benz Cars responsible for Marketing & Sales, commenting on the new model joining the product portfolio. 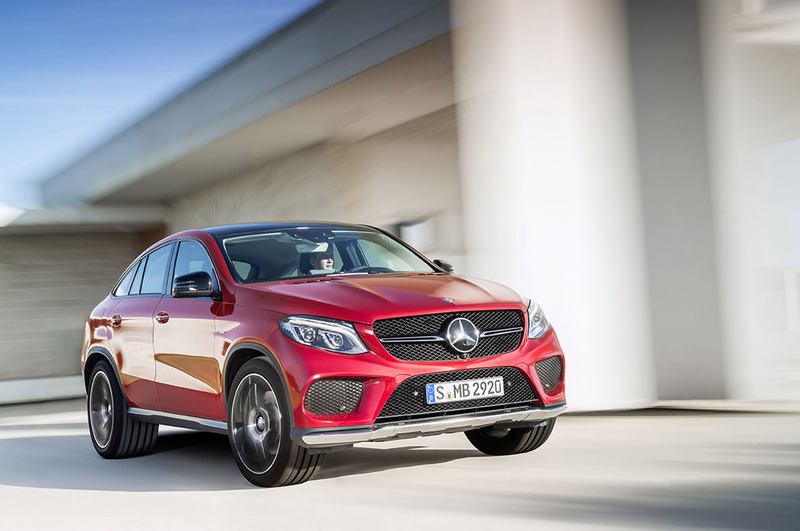 The GLE Coupe feels like a true sports coupe right from the word go. Despite the similarity to an SUV with its raised seating position and an all-round view that is expansive for a coupe, the occupants are led to believe that they are in sports rather than off-road mode. The sound is reminiscent of powerful sports cars and, combined with the spontaneous and direct response to all commands, is guaranteed to get your pulse racing. On the other hand, it can also create a superior feeling of calm, coupled with unshakeably serene driving dynamics. These two different worlds can normally only be experienced in two separate vehicles - an agile, thoroughbred sports coupe and an easy-going, comfortable SUV. But the new GLE Coupe is different: DYNAMIC SELECT enables a wide spread in the driving dynamics and combines these diametrical worlds of experience in a single vehicle - an automobile premiere. The balancing act between extremely sporty yet still comfortable has been mastered especially well in the GLE 450 AMG. 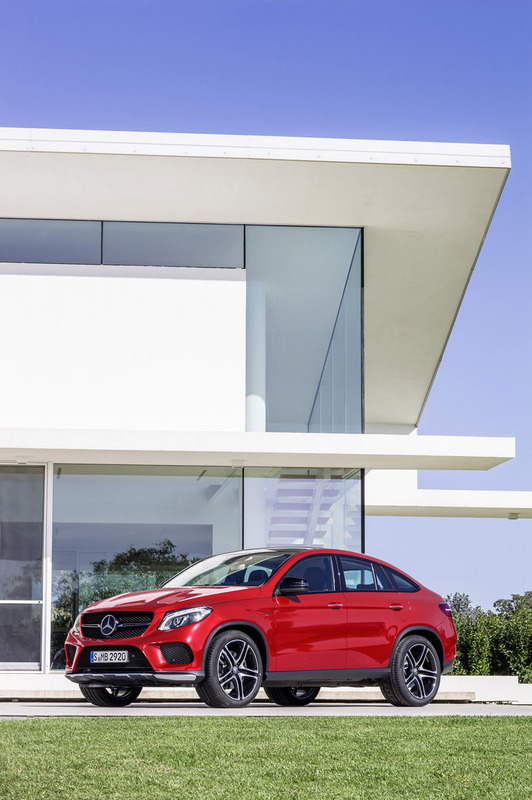 As the first AMG sports model, the V6 top-of-the-range GLE Coupe enables an attractive entry to the world of the sports car and performance brand. 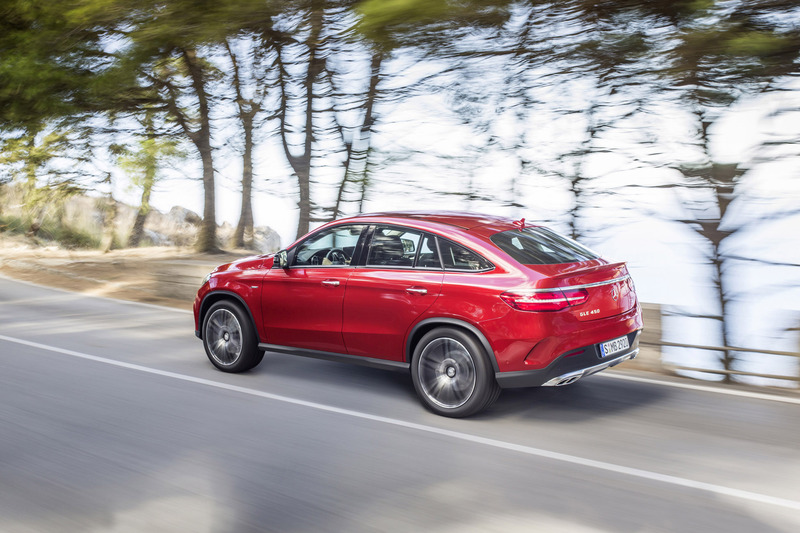 "The GLE 450 AMG Coupe is our first sports model, and further highly emotional and performance-oriented models will follow in the near future. The new product line from Mercedes-AMG has allowed us to make true sports car technology and the fascination of motorsports more accessible", says Tobias Moers, Chairman of the Board of Management of Mercedes-AMG GmbH. "Every vehicle from Affalterbach honours the brand promise of Driving Performance." The new AMG sports models display impressive product substance and honour the promise of sports performance with a higher output class, standard all-wheel drive and also sophisticated chassis solutions. The DYNAMIC SELECT variable dynamic control system assigns fundamentally different characteristics to the five transmission modes of INDIVIDUAL, COMFORT, SLIPPERY, SPORT and SPORT+, which the driver is able to select using a rotary control on the centre console. The system networks all the control systems, generating different driving experience parameters. 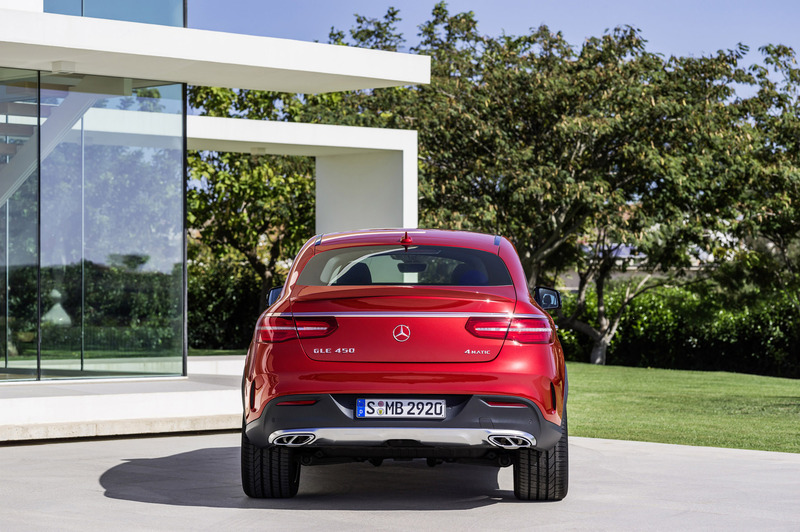 The names speak for themselves: SPORT and SPORT+ turn the GLE 450 AMG into a sporty, dynamic vehicle with pronounced longitudinal and lateral dynamics. COMFORT is the opposite end of the spectrum. Here the emphasis is on the feel-good parameters so typical of classic Mercedes-Benz saloon cars, for relaxed, effortless cruising with the greatest possible energy efficiency. SLIPPERY optimises the handling on surfaces with low friction coefficients such as snow or ice. In addition, INDIVIDUAL mode enables the driver to programme and store personal preferences in the individual control strategies, regardless of the engine variant. 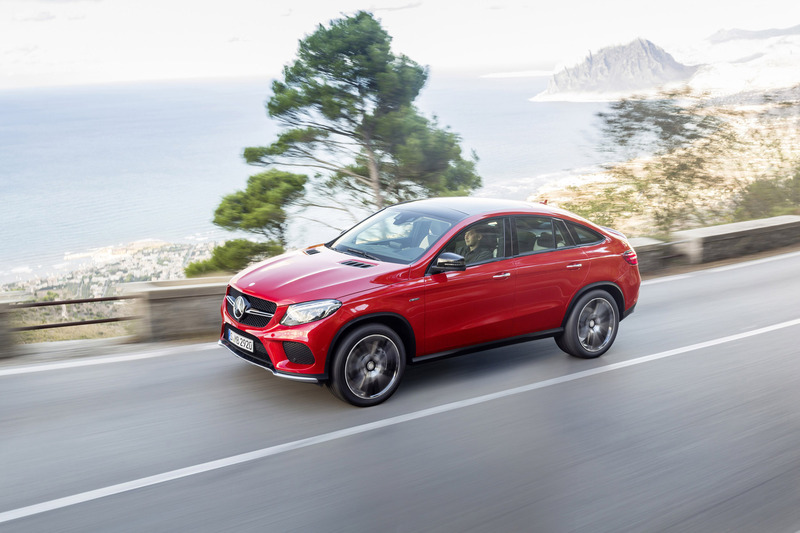 In the new GLE Coupe, the developers were able to show the possibilities of the new 9G-TRONIC nine-speed automatic transmission in an all-wheel drive coupe with a longitudinal drive configuration. Depending on the mode selected for the DYNAMIC SELECT variable dynamic handling control system, the 9G-TRONIC impresses with great agility and responsiveness or poised serenity. The potential of the new transmission is exploited to the full. It offers an impressively high shift speed and perfect transitions for energetic sprinting as well as with gentle, barely perceptible gear changes for enjoyable cruising. 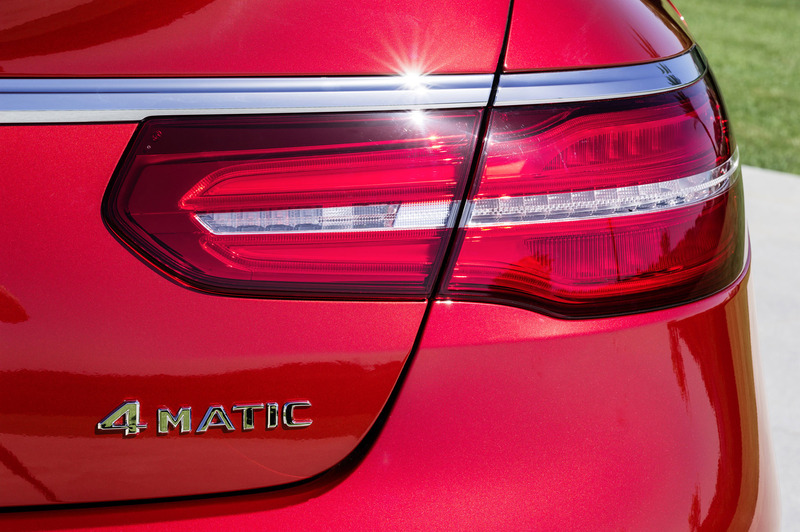 4MATIC permanent all-wheel drive always goes hand in hand with safe, harmonious and sporty handling. 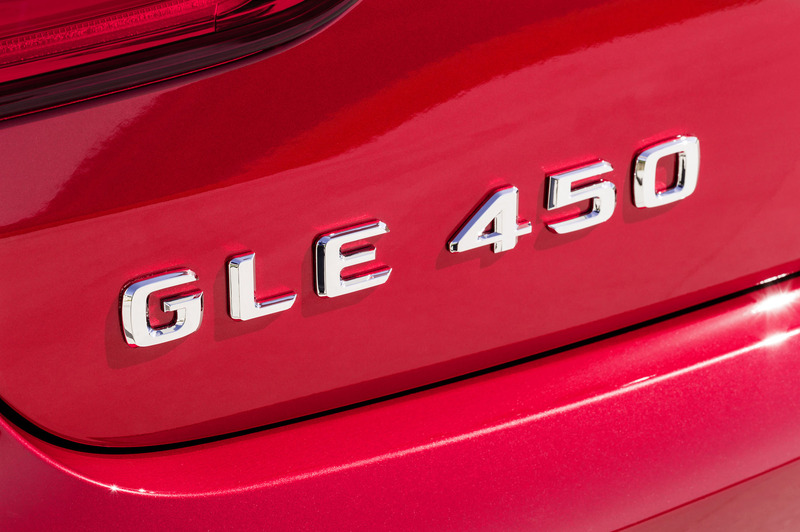 The GLE 350 d and GLE 400 models feature even torque distribution of 50:50 between the front and rear axles. 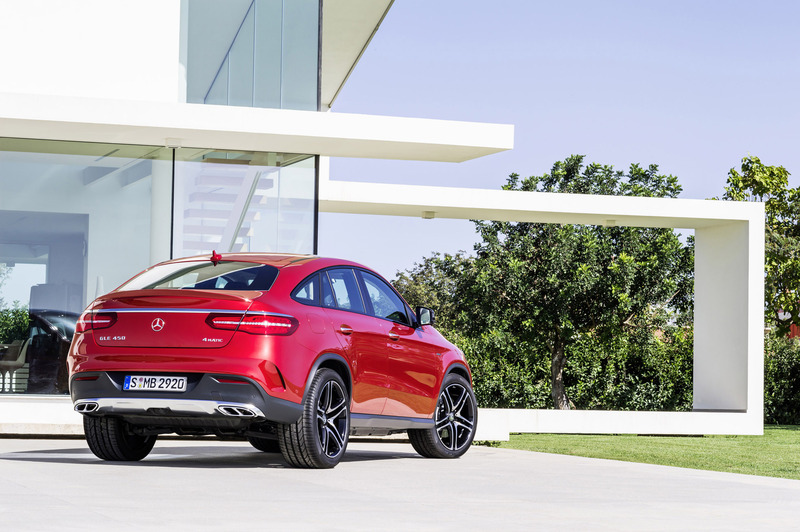 In the particularly sporty GLE 450 AMG Coupe, this configuration is modified in preference of even greater agility and more pronounced dynamics around the car's vertical axis, increasing the thirst for cornering. The drive is split in a ratio of 40:60 here. The DYNAMIC SELECT transmission modes SPORT and SPORT+ deliver superior longitudinal agility and lateral dynamics - specifically as a result of the perfect interplay between the modified driving dynamics control systems ASR, ESP® with Curve Dynamic Assist, the electronic traction system 4ETS and the brake control system ADAPTIVE BRAKE. In addition to the ground-breaking powertrain configuration, the newly designed AIRMATIC air suspension - available for the first time with the continuously variable damping system ADS Plus - guarantees extremely stable driving. The damping system changes its area of emphasis depending on the preselected DYNAMIC SELECT mode. SPORT+ focuses on the greatest possible lateral dynamics with the best possible ride comfort. Conversely, COMFORT mode enables maximum ride comfort with the best possible dynamics. The ACTIVE CURVE SYSTEM with active roll stabilisation is also part of the special sports systems that are activated when the driver selects SPORT or SPORT+. At the same time, the active anti-roll bars on the front and rear axles raise the comfort to saloon level and compensate for even heavy, one-sided excitation - for example when driving over potholes. In combination with the newly configured, degressive Sports Direct-Steer system, whose steering ratio is very direct at 17.4:1, and the compact sports steering wheel, the handling is outstanding in all operating conditions - whether manoeuvring in the city, at high speeds on the motorway, or with a swift style of driving on winding mountain passes. 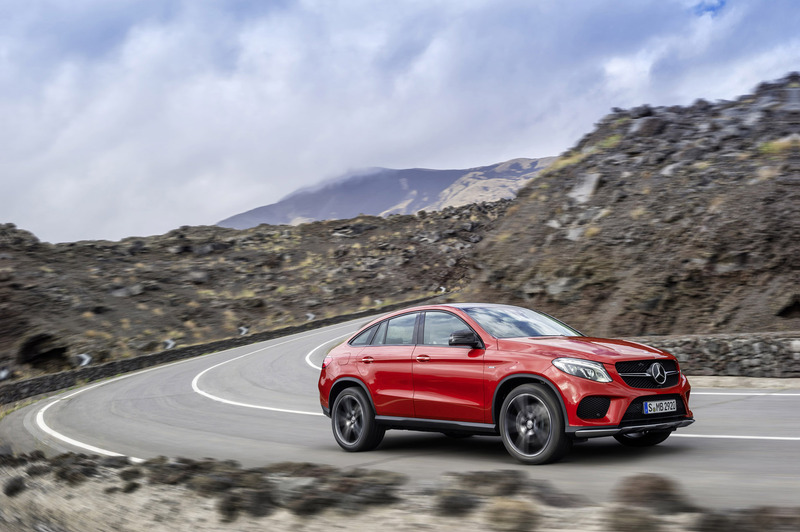 The GLE 350 d 4MATIC and GLE 400 4MATIC models offer the AGILITY CONTROL steel suspension as standard with a amplitude-selective damping system. AIRMATIC air suspension is also optionally available with ADS Plus here. Alongside the appealing design, the exceptional suspension and drive technology, and also the assistance systems familiar from the C, E and S-Class, the GLE Coupe is also equipped with numerous standard or optional equipment details and packages that further enrich the GLE Coupe experience. 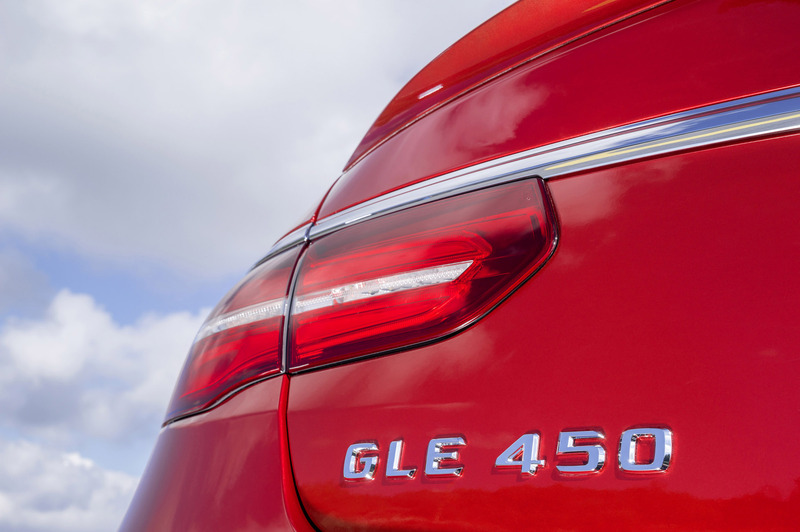 The GLE 350 d 4MATIC diesel model develops 190 kW (258 hp) and offers maximum torque of 620 Nm from 1600 rpm. The GLE 400 4MATIC petrol model is fitted with the new direct-injection V6 biturbo engine rated at 245 kW (333 hp) and 480 Nm from 1400 rpm. The impressive presence of both models is underlined by 50.8 cm (20-inch) 10-spoke light-alloy wheels with 275/50 R 20 tyres. 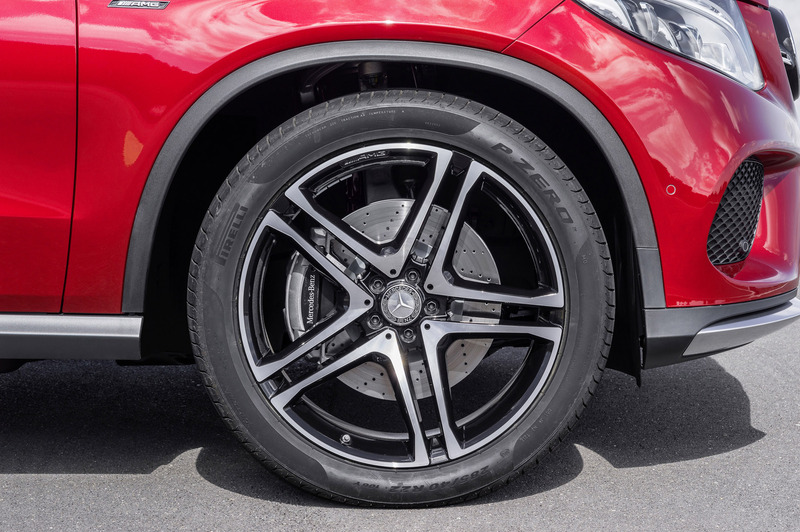 For those in search of something more sporty, 53.3 cm (21-inch) or 55.9 cm (22-inch) light-alloy wheels with mixed-size tyres can be ordered, although the latter are only available in conjunction with the AIRMATIC ADS Plus air suspension. The chrome-effect shoulderline trim strips and the simulated underguards at the front and rear lend the coupe additional exclusiveness alongside the twin-pipe exhaust system with chrome-plated tailpipe trim. Green-tinted, heat-insulating glass reduces the glare of the sun in the summer, and LED technology features in the headlamps, daytime driving lights, rear lights and third brake light. The DYNAMIC SELECT dynamic handling control system, the EASY-PACK tailgate with power opening and closing, and the reversing camera with dynamic guide lines in the display are standard features. Additional active handling safety is provided by ESP® Curve Dynamic Assist and Crosswind Assist, as well as COLLISION PREVENTION ASSIST PLUS. The GLS Coupe is also equipped as standard with the brake system BAS Plus, optionally available with Cross-Traffic Assist. 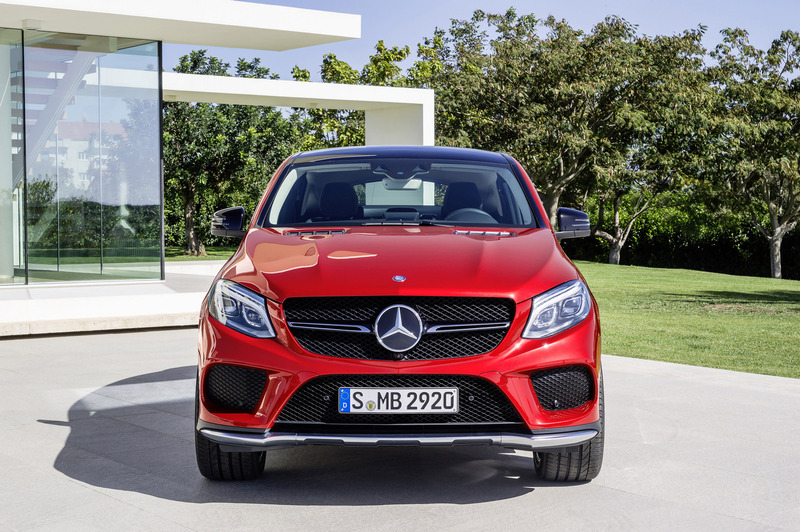 The GLE 450 AMG is a particularly sporty choice. 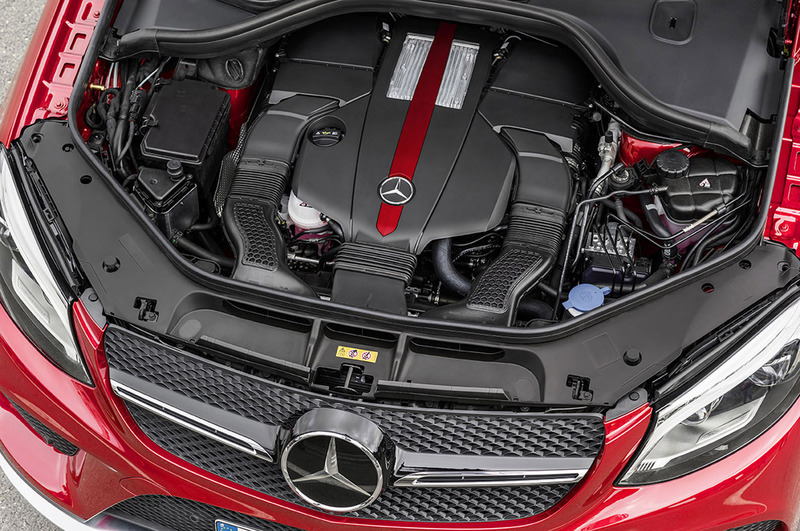 The V6 biturbo engine with an output of 270 kW (367 hp) and 520 Nm from 1400 rpm delivers performance akin to a sports car. The DYNAMIC SELECT transmission mode Sport+ is always available in the top-of-the-range model. 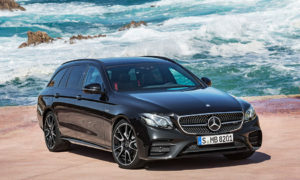 The standard equipment here is upgraded with features such as special AMG bodystyling, which includes a specific front and rear apron, a rear spoiler lip painted in the vehicle colour and 53.3 cm (21-inch) AMG 5-twin-spoke light-alloy wheels with tyres of size 275/45 R 21 (front) and 315/40 R 21 (rear). 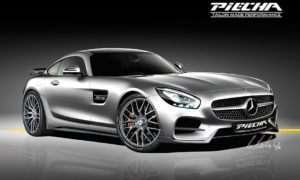 Optionally available here are 55.9 cm (22-inch) AMG 5-spoke light-alloy wheels - also with mixed-size tyres. Excellent traction levels are guaranteed by the impressive tyres of size 285/40 R 22 (front) and 325/35 R 22 (rear). The standard scope of equipment here includes the AIRMATIC package including air suspension and infinitely variable adaptive damping system (ADS Plus) with level control and automatic lowering function at higher speeds, which is optionally available for all models. Sensuality and clarity are the two poles that have determined the design idiom of the Mercedes-Benz brand for almost 130 years and have their origin in the nature of the two inventors of the automobile, Carl Benz and Gottlieb Daimler: Benz was more rationally oriented in his behaviour, whereas Daimler was driven more by his passion. 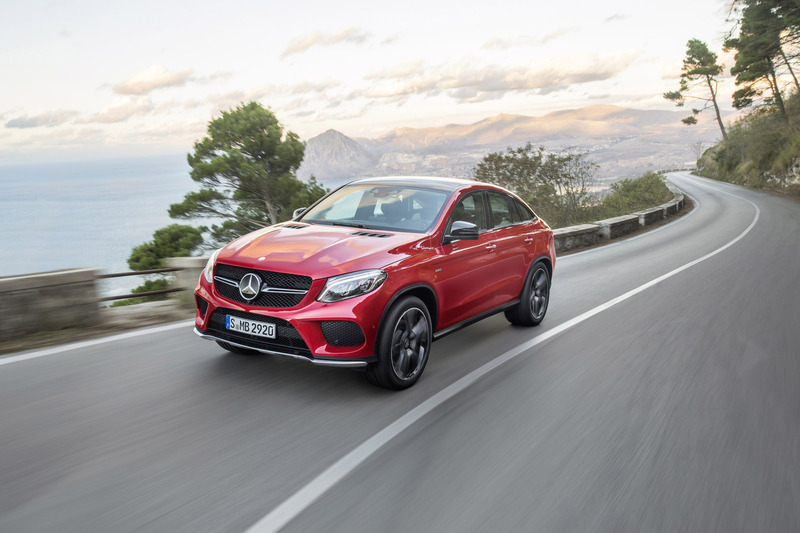 The new Mercedes-Benz GLE Coupe demonstrates almost ideally how this bridge between intelligence and emotion, between tradition and modernity, blends into an attractive symbiosis. The GLE Coupe not only skilfully embodies the firmly embedded principles of Mercedes-Benz design, but also focuses on the essential features of two entirely different automobile genres. On the one hand, the youngest member of the GLE family bears the decisive, essential stylistic feature of all modern Mercedes-Benz coupes: it combines sheer sportiness with a high-level aesthetic and sensual demand for modern luxury. At the same time, however, elements of the classic SUV are recognisable. With muscular wings, large wheel arches, tyres of up to 55.9 cm (22 inches) and also the high belt line and the generous ground clearance, this model takes the perception of a large, four-door coupe to the next level. 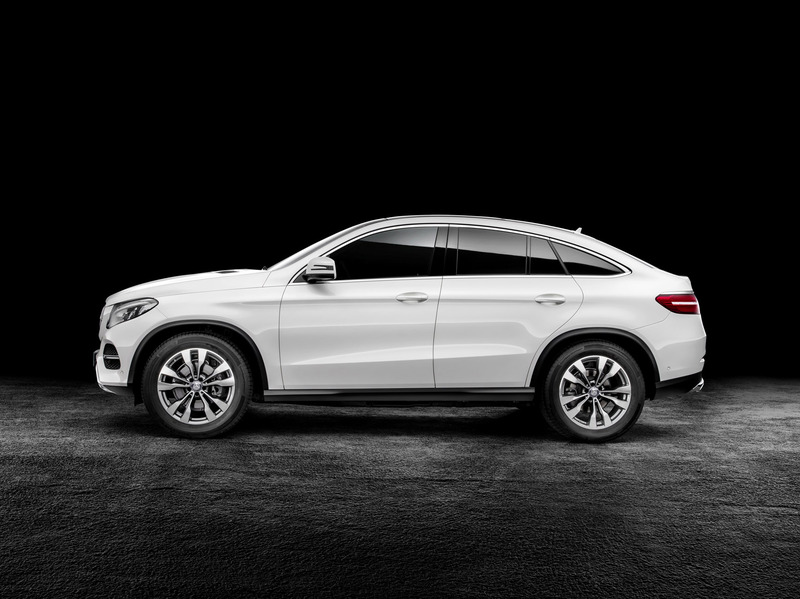 The extreme proportions with superior aesthetics of the new GLE Coupe have emerged from this stylistic gene pool. This is particularly due to the extremely exciting relationship between the low greenhouse and striking body; the silhouette signals dynamism and agility. The upright sports grille with single louvre, framed by three-dimensionally designed all-LED headlamps, is the major feature of the front end with its short, stylish overhang. The forward-sloping bonnet with its typical Mercedes power domes underscores the membership of the GLE Coupe in the line-up of particularly sporty Mercedes-Benz models. A discreet reference to the SUV genes of the vehicle is provided by the harmoniously integrated, illuminated running boards, a typical feature of classic SUVs or off-roaders and available as an option. The coupe-like nature is also emphasised by the design of the rear end with its obvious elements of the design line first presented with the S-Class Coupe. The styling characteristics of this include the slim band of rear lights with their three-dimensional look, the wide chrome insert fitted above and the registration plate now incorporated into the rear bumper. 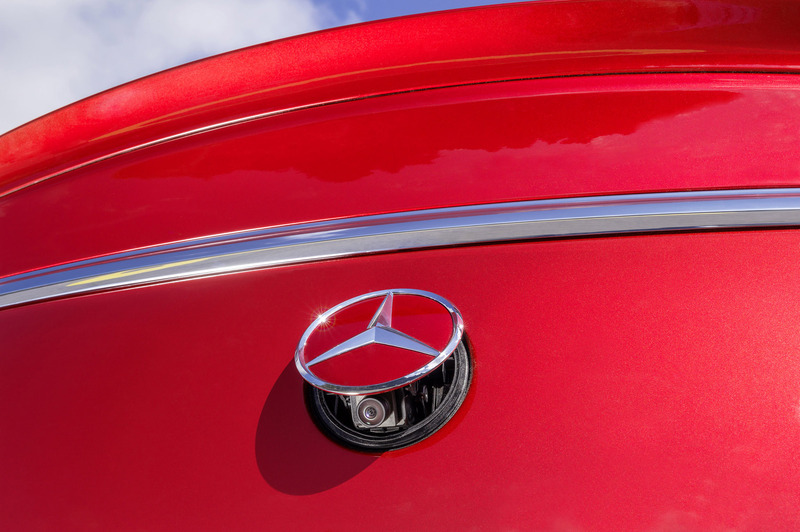 Another feature that has for generations distinguished the large coupe models from Mercedes-Benz is the typical shape of the rear window which is rounded off at the top. 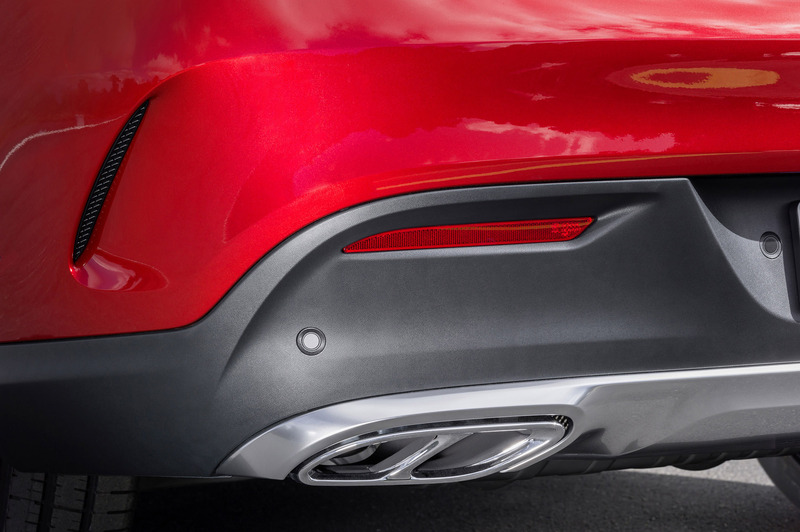 A discreet SUV reference is made by the chrome-plated underride guard in the front and rear, here with the integrated twin tailpipe trim elements of the exhaust system. The attractive sports seats and the compact sports steering wheel, as well as the infotainment elements familiar from the C, E and S-Class initially catch your eye in the interior. The information display, which is not entirely free-standing but partially integrated into the instrument panel, attracts attention and is fitted in an optimum ergonomic position. The centre air vents, with a high-grade silver shadow frame similar to the outer vents, are positioned next to the display. The head unit has the same appearance to underline the homogeneity of the interior. The centre console houses the COMAND Controller with the touchpad fitted above in an optimum ergonomic position. The equipment and appointments in ARTICO man-made leather and the trim elements in light longitudinal-grain aluminium are also impressive. 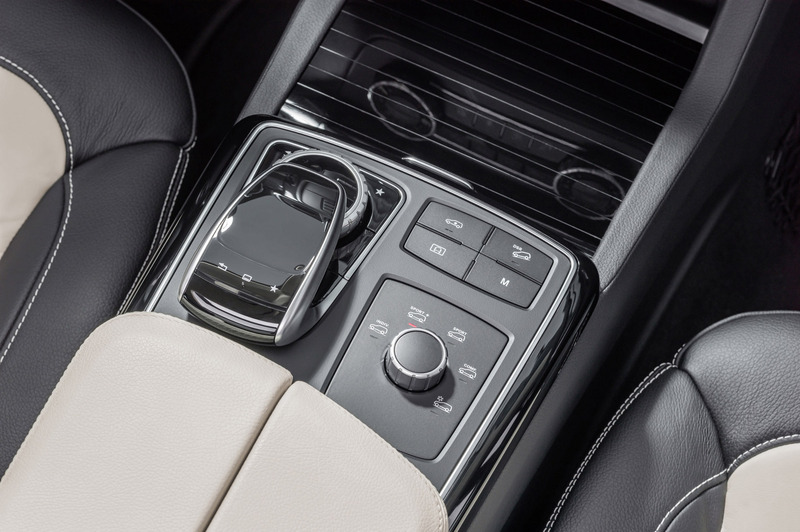 Good infotainment is guaranteed by the Audio 20 CD system with eight loudspeakers and the Remote Online communication module for the use of the Mercedes connect me services in Europe (may vary from country to country). The interior of the GLE 450 AMG is an impressive sight with AMG sports seats and the black nappa leather AMG sports steering wheel in 3-spoke design as well as the trim elements in light longitudinal-grain aluminium and the sports pedals in brushed stainless steel with rubber studs. AMG carbon-fibre trim and piano lacquer enhance the appearance of the interior as an additional option. 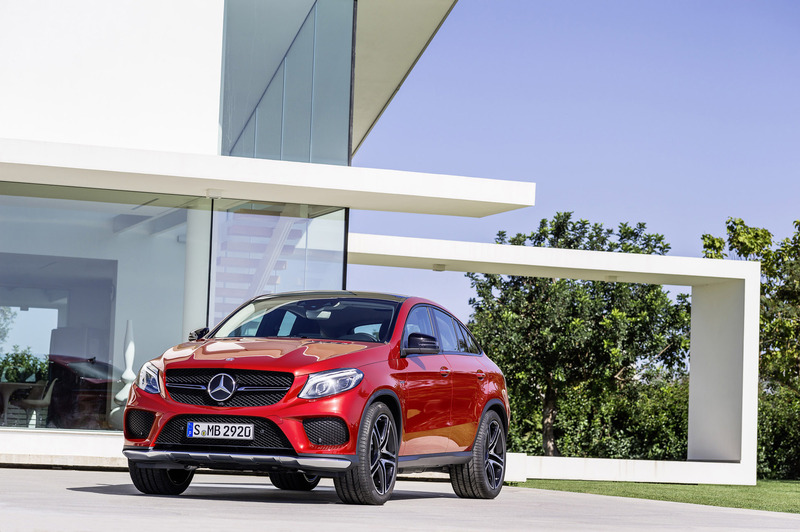 Popular equipment details are also combined in attractive packages for the GLE Coupe. The Driving Assistance package Plus includes DISTRONIC PLUS with Steering Assist and Stop&Go Pilot, PRE-SAFE® Brake with pedestrian detection, BAS PLUS with Cross-Traffic Assist, Active Blind Spot Assist, Active Lane Keeping Assist and PRE-SAFE® PLUS. The Parking package with 360° camera and Active Parking Assist with PARKTRONIC guarantees an excellent overview and problem-free manoeuvring into and out of parking spaces. Night-time vision is improved by the LED Intelligent Light System which is a standard feature on all models; adverse weather conditions with impaired view are defused by MAGIC VISION CONTROL - the heated, adaptive windscreen wiper system. The extremely large interior for a coupe provides space for up to five people. The rear seat bench in the GLE Coupe is even the widest in its class. Drivers who order the optional large panoramic glass roof are rewarded with an even greater feeling of spaciousness for all the passengers. With a maximum of 1650 litres, the coupe also offers the largest luggage compartment in its class and just happens to hold the world record for luggage compartments in coupes. For the first time in this segment, Mercedes-Benz is offering a fully electric extendable and retractable trailer coupling, which also includes ESP® trailer stabilisation. 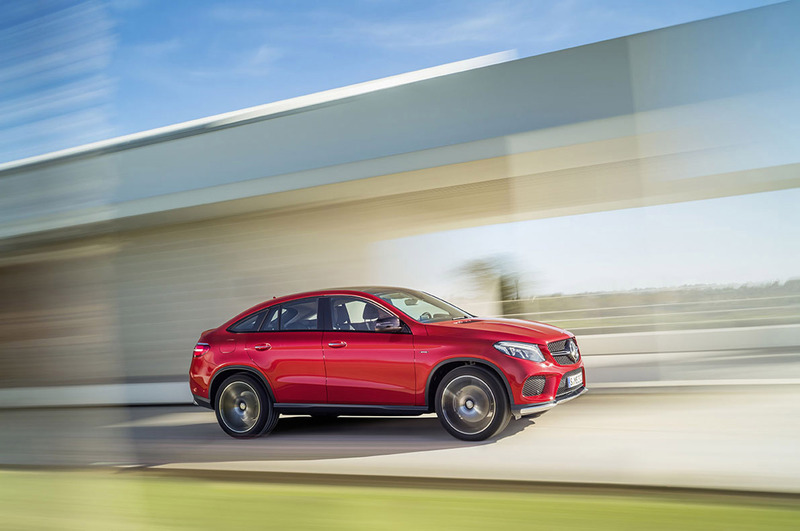 The towing capacity of the GLE Coupe is up to 3500 kg (braked). As an option, the latest generation of COMAND Online offers perfect infotainment with a 20.3 cm (8-inch) TFT display and intuitive touchpad. The system also includes a DVD player and Traffic Sign Assist with traffic sign recognition including wrong-way warning function. If required, the customer can equip COMAND Online with the 6-disc DVD changer, Rear Seat Entertainment System with remote control, TV receiver or Bang & Olufsen Sound AMG sound system. There are almost limitless possibilities when it comes to customisation of the GLE Coupe - and the equipment packages again play an important role. 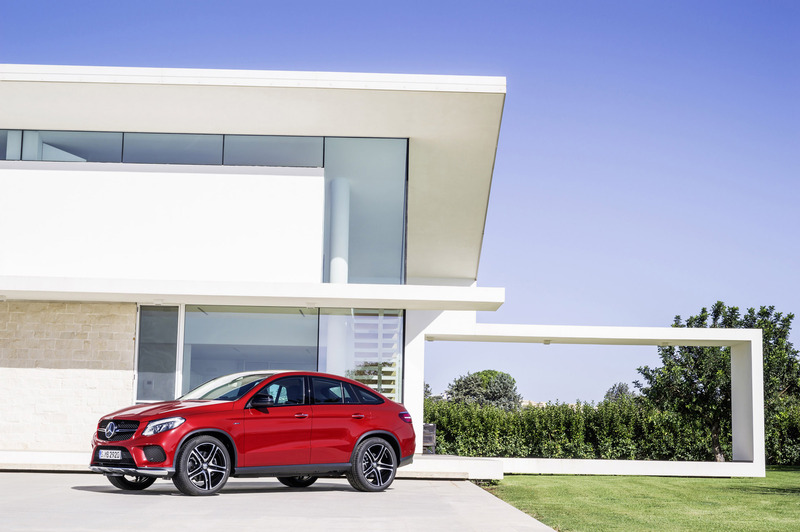 For instance, customers can give their GLE Coupe an especially sporty look with the AMG Line Exterior, including the AMG front and rear apron and the 53.3 cm (21-inch) AMG light-alloy wheels. Those who like things even more exclusive can combine this feature with the Night package, in which the louvre in the radiator grille and the exterior mirror housings are in high-gloss black, for example. At the same time, the wide selection of solid and metallic paints and the almost limitless possibilities for interior design increase the potential for individual customisation. A total of 11 paint finishes are available, of which seven are metallic colours and two are special paint finishes with special-effect pigments in designo diamond white or designo hyacinth red metallic. The interior radiates modern luxury and can be given a design ranging from ambitious and sporty to classic and elegant, depending on personal taste. The scope here ranges from single-tone black interior appointments to various combinations in which black is used with ginger beige, crystal grey, saddle brown or porcelain. The interior of the GLE Coupe is particularly impressive in two-tone designo exclusive nappa leather in porcelain/black. The AMG Line Interior transfers the sporty look to the interior with features such as AMG sports seats, AMG sports steering wheel, nappa leather appointments and aluminium sports pedals. The designo Exclusive package is packed full of luxury: heated comfort seats with diamond-pattern stitching, instrument panel and door panelling in designo leather and the black DINAMICA roof liner provide for even more exclusive travel. Depending on personal preference, the trim elements shine in light longitudinal-grain aluminium, brown open-pore ash wood, brown eucalyptus wood, dark-graphite poplar wood or black AMG carbon fibre/piano lacquer. The Mercedes-Benz 4MATIC success story began in 1985. The all-wheel drive presented in an E-Class was the first automatically controlled drive system in a premium vehicle. The customer was able to choose between six different models. Nowadays, around 30 years later, the portfolio of passenger cars with all-wheel drive has grown to include more than 70 models in 18 model series. From the A to the G-Class, each model receives a tailored 4MATIC solution - to match each different vehicle character. The AMG sports models such as the GLE 450 AMG receive a performance-oriented 4MATIC drive which sends the drive torque more towards the rear axle - unlike in the standard model. This distinctly rear-biased power distribution provides for the signature AMG high driving dynamics and superlative driving enjoyment. 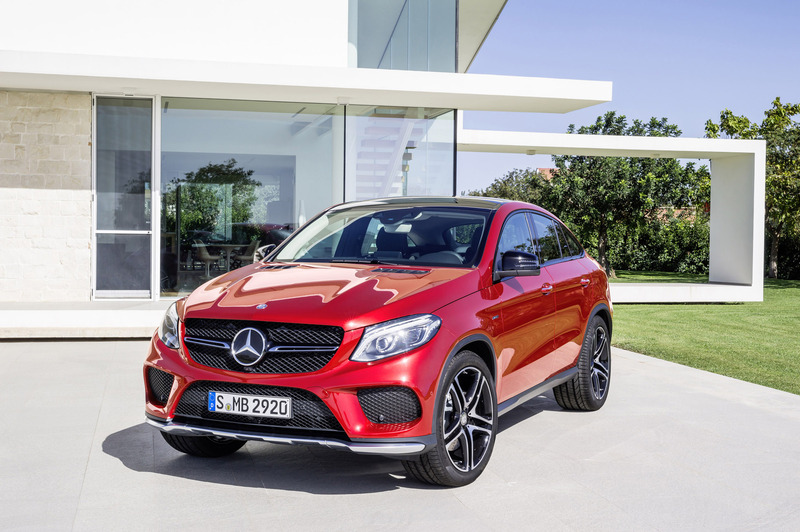 The premiere of the GLE Coupe restructures the successful SUV range from Mercedes-Benz. The system centres around the five core model series, A, B, C, E and S, which will continue to be used to provide orientation for our customers. In the case of the model designations for the SUVs, in a tribute to the legendary G-Class, all SUV models will in future have the first two letters "GL" in their name. The "G" here denotes the car's lineage. The "L" is a letter that appears time and time again over the history of Mercedes-Benz: it is a linking letter that makes the model designations easier to remember and easier to pronounce; one that is familiar from the legendary SL, for example, or from the more recent CLS and CLA. It is followed by the third letter, which indicates the relationship to the relevant core model series.